These famous Bruce Lee quotes come from a man who was a martial artist, philosopher, actor, and filmmaker. He lived from November 27, 1940 until July 20, 1973, and left a memorable legacy. In the 20th century, as a result of his movies, approach, and charisma, he became an icon. Seeing a “Bruce Lee movie” was an event. Lee Jun-fan (his birth name), aka Bruce Lee, is considered by many to be one of the most influential martial artists of all time. Enjoy his words of wisdom listed below. 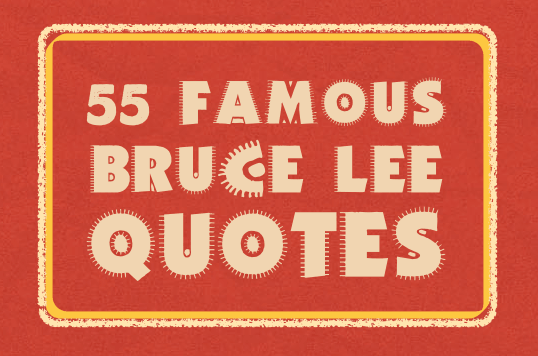 We hope you’re enjoying these famous Bruce Lee quotes. It’s hard to believe that he was on the earth for only 32 years. Running water never grows stale. So you just have to keep on flowing. In order to control myself I must first accept myself by going with and not against my nature. Only the self-sufficient stand alone – most people follow the crowd and imitate. If you think we missed any famous Bruce Lee quotes, please let us know via the Contact page. Thanks. At the tender age of 32 years old, Bruce Lee died of an allergic reaction to the tranquilizer meprobamate. Meprobamate is the main ingredient in Equagesic, an ingredient commonly used in painkillers, which Lee took the evening of his death. Linda Lee Cadwell, Bruce Lee’s widow, wrote to the Los Angeles Times to correct them on an article stating the cause of death. Despite being on earth for such a short time, his reach has been very long.